Argan Oil has become one of the latest trends in beauty and cosmetics industry. Perhaps you've noticed as you browse the beauty aisles of your favorite stores that new products and even some old favorites are now boldly labeled with this "liquid gold" as the star ingredient. After seeing a number of products add argan oil to the ingredient list, I decided it was time to find out what all the hype is about. Argan oil is a plant oil produced from the kernels inside the pit of the fruit from the argan tree, which is native to Morocco. The pit of the argan fruit is sun dried and then cracked between two stones to remove the kernel. The kernel is ground into a paste and the paste is then squeezed by hand to extract the oil. Talk about time consuming right??? Argan oil is said to heal many skin ailments and protect against premature aging thanks to high levels of vitamin e and fatty acids. To get the best results on your hair, skin, nails, and body, pure argan oil is recommended. 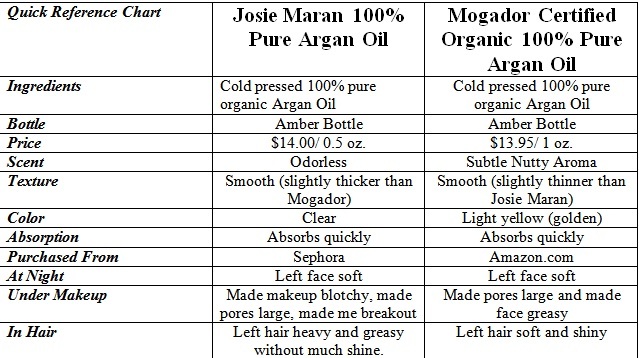 With that in mind, I decided to test one of the top rated and more expensive brands of pure argan oil, Josie Maran 100% Pure Argan Oil, along side another brand of pure argan oil; Mogador Certified Organic 100% Pure Argan Oil. I used the article "7 Warning Signs that your Argan Oil is Impure" from the Saadia Organics website as a reference when evaluating the two oils. 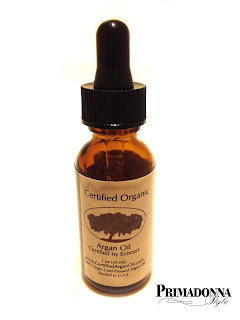 This list gives detailed information on some things to look for in a quality argan oil. The ingredient list should only say: 100% Argan Oil or 100% Argania Spinosa Kernel Oil. 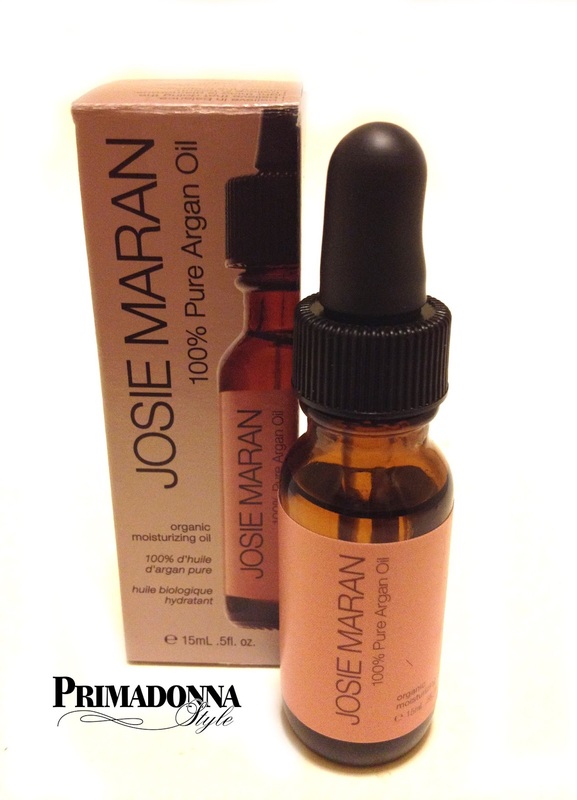 Both Josie Maran and Mogador's lists their ingredients as 100% pure, organic, cold-pressed argan oil. The bottle should be glass and dark such as amber or cobalt. Light colored and plastic bottles make the oil deteriorate faster. 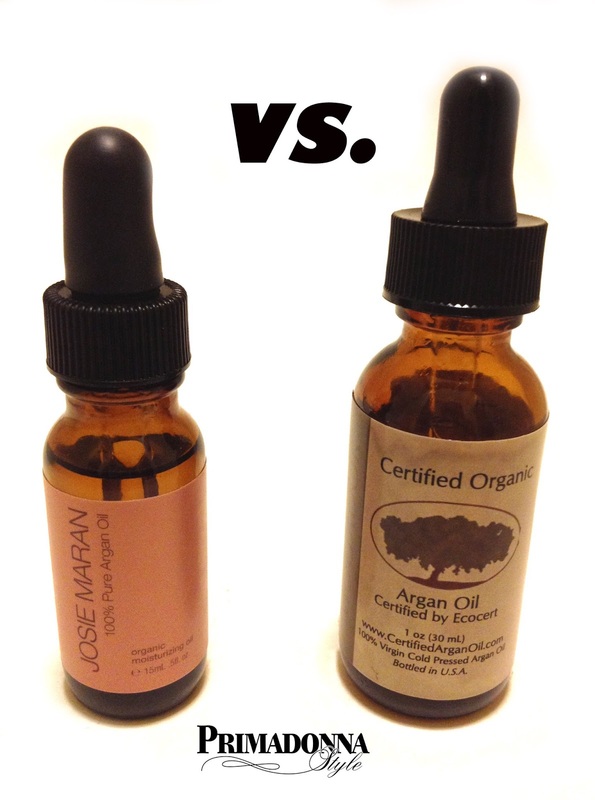 Both Josie Maran and Mogador's Argan Oils come in an amber colored bottle with a dropper for convenient dispensing. Because making argan oil is an arduous task, it tends to be expensive. Josie Maran $14/0.5 oz and Mogador $13.95/1.0 oz. At this price point, you get half an ounce more if you purchase Mogador. Genuine, raw, cosmetic-grade Argan Oil is said to have a ‘nutty’ scent. The nutty scent was present in the bottle of Mogador Argan Oil that I tested, but the Josie Maran Argan Oil did not have any scent at all. I didn't find the scent of the Mogador Argan Oil offensive, and it faded immediately upon application. Argan Oil should be smooth, silky and disappear into your skin quickly. It should not feel slimy, sticky or watery. Both Josie Maran and Mogador have a smooth texture that absorbs quickly into the skin. The Josie Maran Argan Oil is slightly thicker than the Mogador Argan Oil. At Night: Both Josie Maran and Mogador absorbed quickly and left my face feeling soft, but neither compare with the glow that I get from using emu oil. I didn't see anything special from using either. I did try mixing them with emu oil and the results were much better when mixing the Mogador Argan Oil with my Ultra Clear Emu Oil. Under Makeup: Jose Maran made my face look oily, my makeup blotchy, and my pores looked huge. As the day wore on, my face looked like it was covered in fine bumps. I also got several new pimples after using it under my makeup. Mogador did not make my makeup blotchy but my pores looked larger and I had to blot often as the day wore on. On Hair: I tried applying a small amount of both Josie Maran and Mogador to my wet hair after washing. (*Note* I added this product to my relaxed african-american hair, NOT my sew-in.) After blow drying I was very impressed with the hair that had the Mogador applied to it. It looked shiny and felt light and soft. The hair that I applied Josie Maran to wasn't as shiny, and looked a bit greasy and heavy. I mentioned earlier that Josie Maran argan oil seemed a bit thicker than the Mogador, so I attribute the heavier feel to this. 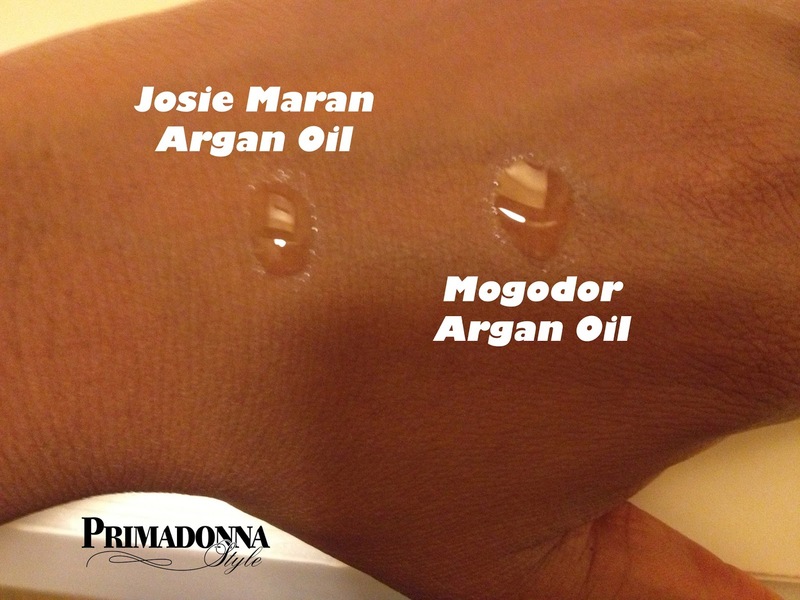 If I purchase Argan Oil again, I would go with Mogador. It is a better value for the price, and it gave me better results. *Update* Here's a recipe using Mogador Argan Oil that helps moisturize & balance my skin!! Check them out at the links below! You're welcome; thank you for reading! 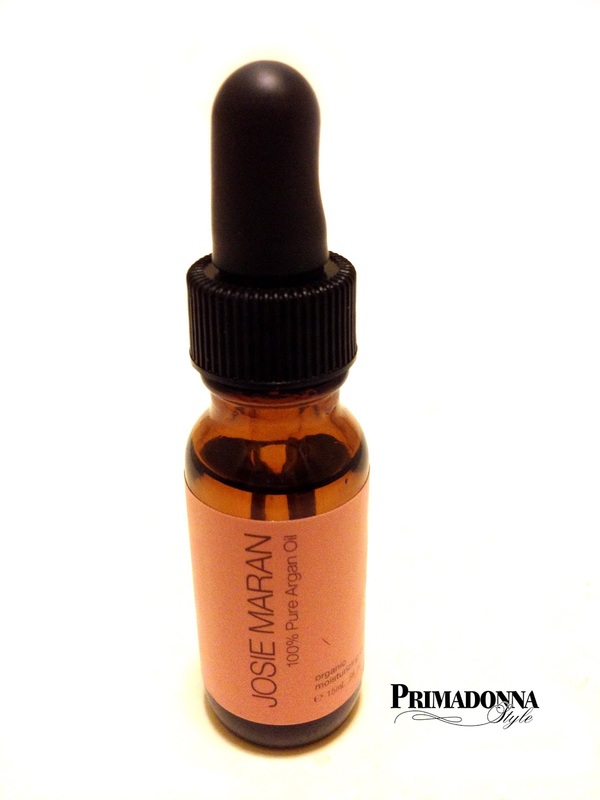 You got better results with the Mogador because it was not processed with heat like the Josie Maran was. Argan oil should have that slight nutty scent which you will find in the Mogador. The fact that Josie Maran's argan oil is odorless is an indication that it was not cold-pressed. 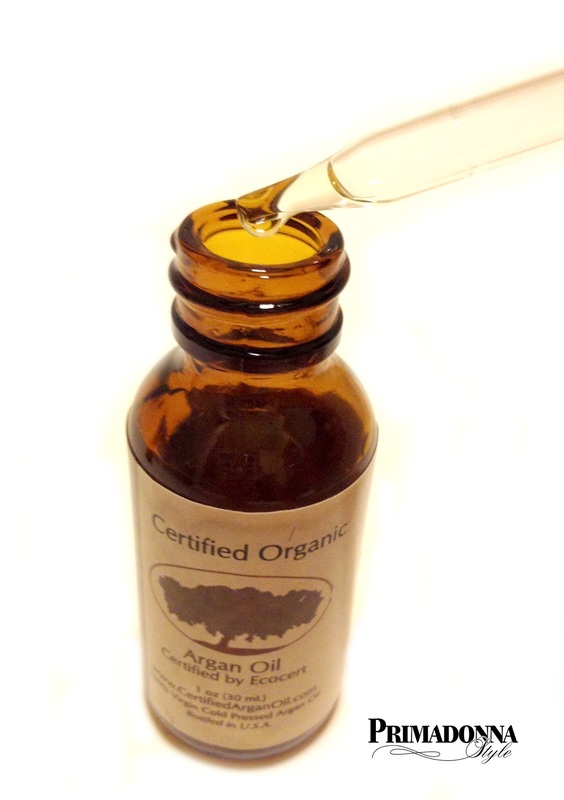 When heat is used, argan oil can lose a lot of its valuable properties. Thanks for the info, and thank you for reading! I visited Morocco recently and enquired on why some oils had such a strong odour I was told that If the oil smells really strong its most likely the kernels that are excreted from goats and sold onto the processing plants. No matter how much processing they do the smell will always be strong. Have you ever bought and tried the argan oil from saadiaorganics? No. I purchase most of my oils from Dr. Adorable.